Public Service: White House Recognizes California Radio Amateur as "Champion of Change"
Amateur Radio volunteers assisting with communications in the aftermath of the devastating Colorado flooding came in for high praise recently for their role in helping to safely evacuate youngsters and others from a mountain environmental education center threatened with being cut off by road washouts. In an Op-Ed piece last week in the Longmont Times-Call, Sandra Harem, the executive director of the JPII Outdoor Lab in Estes Park, Colorado, cited the "amazing help" from hams and others in getting the students, school staff and Lab staff out of harm's way on September 12. "The staff of the JPII Outdoor Lab would like to extend our heartfelt gratitude to the volunteers of the Mountain Emergency Radio Network [MERN] and so many others who helped the seventh-grade students, chaperones and staff of St Vincent De Paul Catholic School and staff of the JPII Outdoor Lab get home safely to their families," Harem said. 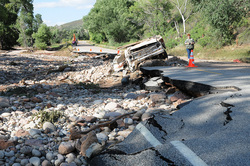 On September 12, Harem called the Larimer County Sheriff's Office to inquire about road conditions. Because of the heavy rainfall, she and the school's assistant principal were getting a group of seventh graders ready to leave as soon as possible. "The sheriff's office said Highways 34 and 36 were closed," she recounted. "We worked on alternative routes." An hour later, the director of the affiliated High Peak Camp told Harem that they needed to relocate in case power went down. The sheriff's office advised relocating to a Red Cross evacuation center in Allenspark, which subsequently invited the group. Hearing the call, MERN volunteer Karel Kosman, KDØRFT, contacted fellow MERN member Steve Coles, KDØRFQ, that the group needed help evacuating. Coles deployed to the JPII Outdoor Lab and helped relocate the students, staff and chaperones safely, Harem said. After Coles left to help others, communication was cut off, so the assistant principal and Harem drove to the Allenspark Fire Station and to the Estes Park Police Station hoping to get better information. "It took us until 9 PM to return to our group at Highlands [the shelter site] by hiking and a few helpful car rides, because Highway 7 had ruptured in two places," Harem said. Early the next morning, Coles was back to help with communication with the Boulder County Office of Emergency Management. According to Harem, Coles advised the OEM to ask the Colorado Department of Transportation if it might be possible to take buses on the Peak to Peak Highway. A plan evolved to have the buses meet the group at the point of a highway washout near the junction of Highways 72 and 7, then walk the students across the compromised road to the buses. The Archdiocese of Denver, the superintendent of Catholic Schools and the Boulder County OEM okayed the plan. That afternoon, buses arrived on Highway 7. "We transported the students, chaperones, St Vincent staff and JPII Outdoor Lab staff to the meeting point, and all students were reunited with their families at St Vincent De Paul Catholic School that evening," Harem said. Among others, Harem praised Coles for "his tireless patience, persistence and care of all of the students, chaperones and staff," and Kosman "for radioing on our behalf to Steve Coles." She also thanked all MERN members "for making it possible to have such effective communication during an emergency." ARRL Colorado Section Manager Jack Ciaccia, WMØG, says MERN is an Amateur Radio repeater system built by members of the Boulder County (BCARES) group and was the brainchild of BCARES Emergency Coordinator Allen Bishop, KØARK. "The two MERN ham radio operators that were involved in this rescue, Steve Coles, KDØRFQ, and Karel Kosman, KDØRFT, are two of some 60 mountain residents who attended the ham radio classes put on by BCARES members in the mountain communities over the last year and were recently licensed after taking the FCC exam given by ARRL Volunteer Examiners who are also members of BCARES," Ciaccia pointed out. He notes that the hams at the Boulder OEM and the EOC were BCARES operators who were monitoring all traffic from the MERN repeaters as well as from other EOCs on the air from flooded counties along the Front Range as well as communications from the state EOC. "The hams who happened to be monitoring at the Boulder EOC at the time were George Weber, KAØBSA, and Dave Sharpe, KIØHG," Ciaccia said. "These two hams, coincidentally, had been Steve and Karel's MERN ham radio license instructors and Volunteer Examiners as well as part of the BCARES group who built and installed the MERN repeaters." Ciaccia said it was Weber and Sharpe who coordinated with the Boulder OEM and Transportation Group to arrange for the buses, then got them on their way by relaying communications from the MERN radio operators in the flood-stricken zones. The White House this week recognized Matt Brisbois, KI6RBS, of Newport Beach, California, as part of its Champions of Change program. The Newport Beach Community Emergency Response Team (CERT) program coordinator "has trained and mentored more than 1000 residents, business and community leaders, and educators, resulting in the highest per-capita volunteer-to-resident ratio for CERT programs in all of California," a City of Newport Beach news release said. 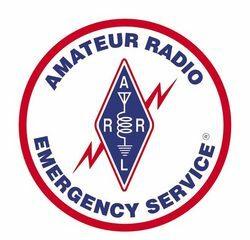 CERT, a Federal Emergency Management Agency (FEMA) program, seeks to train members of the community to prepare for and assist in the event of an emergency or disaster; Amateur Radio training and communications are among the Newport Beach CERT activities. Brisbois, a Newport Beach Fire Department life safety specialist, was one of 18 individuals selected this year as "Champions of Change for Community Preparedness and Resilience." "On behalf of the Newport Beach Fire Department and its Community Emergency Response Team program, it's a true honor to be here among all these award recipients and be recognized as a Champion of Change," Brisbois said at the ceremony, headed by FEMA Administrator Craig Fugate, KK4INZ. "I really wish I could have all 1000 of my volunteers here today..." Brisbois said the volunteers in his city of 88,000 "believe in what they're doing," and "really should be up here" at the ceremony. "If we can develop a culture of preparedness in Newport Beach and with our residents," he concluded, "I really believe anyone in the United States can." The White House Champions of Change program recognizes individuals, businesses, and organizations doing "extraordinary things to empower and inspire members of their communities." 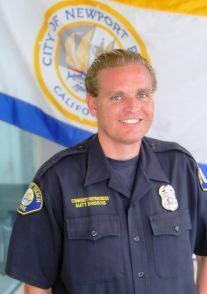 Newport Beach Fire Chief Scott Poster commented, "To have Matt recognized as a Champion of Change for his efforts is a well-deserved commendation for Matt, our program and all of the volunteers." While in the nation's capital Brisbois and CERT board member Karen Tringali also will pick up the Individual and Community Preparedness Award for Outstanding Community Emergency Response Team Initiatives that the city won from FEMA last year. A life safety specialist since 2007, Brisbois has been the recipient of several awards, grants and honors over the years, including a Bravo for Bravery Award. The one-time lifeguard, coach, and substitute teacher once served as a Congressional intern and holds master's degrees in education and politics. The Amateur Radio on the International Space Station (ARISS) program is hoping its "Ham Video" digital television transmitter, now stowed onboard the International Space Station (ISS), will be installed and commissioned this fall. US Astronaut Mike Hopkins, KF5LJG, is scheduled to handle the tasks involved with getting the S Band Ham Video DATV setup on the air from the ISS Columbus Laboratory. He and Russian cosmonauts Oleg Kotov and Sergey Ryzanskiy headed into space September 25 aboard a Soyuz spacecraft to join their Expedition 37 crewmates on the ISS. The Ham Video project has a low priority, however, and it could be a while before live digital TV images show up from the ISS. 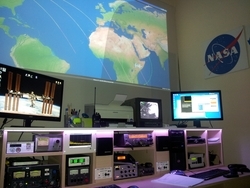 ARISS-EU Chairman Gaston Bertels, ON4WF, said live commissioning will take place in stages, each during a full pass of the ISS over the Italian Space Agency's Very Long Baseline Interferometry station near Matera in southern Italy. 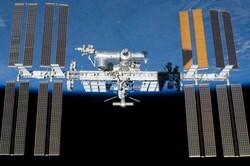 That station will be used to receive the DATV signal from the ISS. 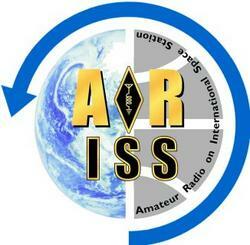 Ham Video live commissioning will take place in stages, each during a full pass of the ISS over southern Italy. "It is not yet known if these passes will be chosen in close succession, or if they will cover several weeks," Bertels said in a recent Ham Video update. ARISS has proposed that the European Space Agency (ESA) transmit over all continents, with the camera turned off between commissioning passes. The camera operates from batteries, and having to service it could require a prohibitive amount of crew time, always at a premium. "During commissioning activities, the astronaut will activate the Ham Video transmitter with the camera live in all possible configurations -- two antennas, four frequencies and two symbol rates," Bertels told ARRL. "This will be done during three or four passes of the ISS over southern Italy, where the operating ground station is located." 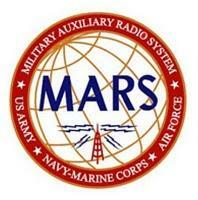 At its meeting in Atlanta, Georgia, September 17-19, US Army MARS national leadership approved a study of HF transmission methods for use in extreme propagation failures, and it invited nominations for an IT specialist to coordinate such a project. Program Officer Paul English, WD8DBY, who presided, addressed the need for an HF mode capable of high penetration through adverse conditions, such as an extreme solar event or other potentially catastrophic situation in which HF reception suddenly blacked out. A leader, hearing no radio activity anywhere, would need to launch a beacon signal informing anyone who manages to hear it where an emergency net would be called up once propagation returned. Some discussion involved existing weak-signal digital modes such as JT65 and WSJT and possible limitations under disaster conditions with unstable power sources. The region directors voted to pursue a solution. "If someone will build a linear PSK31 transponder, I have a launch opportunity in 9 months," Bruninga said in a posting to the AMSAT Bulletin Board. "All it needs to be is a PSK31 linear receiver on 28.120 MHz (3 kHz bandwidth) with AGC coupled to a downlink UHF FM transmitter of about 1 W," and the transponder should be able to fit on a 3.5 inch square card. World Radiosport Team Championship 2014 (WRTC2014) organizers have announced the operators (listed below) who have been invited to form teams for the competition to be held in New England during July 2014. In addition to the 51 team leaders who emerged from the qualifying process, the announcement includes two "wild card" selections, a youth team, and the defending champion from WRTC2010. WRTC is a competition among two-operator teams. Team leaders must accept their invitations and nominate teammates by October 15. If a team leader is unable to accept, the invitation will go to the next-highest qualifying applicant from the selection area. Managing the selection process was Dan Street, K1TO, a three-time competitor and winner of the event. "The competition for a place at WRTC2014 was very close," Street said. "With qualifying points available from an unprecedented 55 events, it was terrific that a number of the selection area races came down to the very final qualifying event -- the ARRL DX SSB 2013." Two wild card teams were selected from among the remaining applicants. The youth team is a special category created by WRTC2014 organizers to recognize contesters younger than 25. By tradition, the prior WRTC champion is automatically invited to defend the title. Vladimir, RW1A, winner of WRTC2010 in Moscow, had already indicated his desire to compete in New England. The maximum possible qualifying score was 11,600 points. "It is impressive that more than 25 applicants scored over 11,000!" WRTC2014 Chair Doug Grant, K1DG, said. "WRTC2014 will have the highest-qualified team leaders ever." World Radiosport Team Championship events are held every four years. 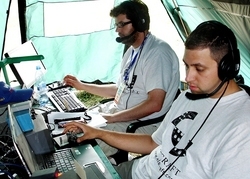 The competition consists of approximately 50 two-person teams of Amateur Radio operators from around the world, going head to head in a test of operating skill. All stations operate from the same geographic region with equivalent antennas and 100 W output, eliminating all variables except operating ability. Once all team leader invitations have been accepted, only one other way will remain to gain entrance to the competition -- through a team sponsorship. A team sponsor donation earns the right to select a team, and only two team sponsorships are available. Contact Doug Grant, K1DG, or Randy Thompson, K5ZD, for details. Sponsored teams will be announced later. Read more. Even as preparations continue apace for World Radiosport Team Championship 2014 (WRTC2014) next July in New England, the World Radiosport Team Championship Sanctioning Committee is seeking a sponsor for the 2018 competition. "Like the International Olympics, it is important to provide continuity for the WRTC program and give the radiosport community as much time as possible to prepare for each event," the committee announced recently. "Thus, it is appropriate at this time to begin the process of considering where WRTC2018 will be held and who will make up the organizing committee." The Sanctioning Committee evaluates requests to host a WRTC and selects the winning applicant. The WRTC Sanctioning Committee is asking potential sponsors to send letters of intent to its chairman, Tine Brajnik, S5ØA, Velike Lipljene 24, 1311 TURJAK, Slovenia. Letters should identify the group's primary leaders and contact information, along with the general time frame and location for the event. The committee then will respond with the WRTC requirements document, from which a formal proposal can be created. The deadline to submit letters of intent is December 31, 2013. Formal proposals will then be accepted until March 1, 2014. The WRTC Sanctioning Committee plans to announce the selected hosts for WRTC2018 at the closing banquet for WRTC2014 next July. Read more. Special event station ZM9ØDX will be on the air from New Zealand for 13 months, from October 1, 2013, until October 31, 2014, to mark the 90th anniversary of that country's first DX activities on the amateur bands and to commemorate the DX pioneers who made them happen. The first New Zealand-to-Australia contact took place in April 1923, followed by then-world record contacts between New Zealand and Argentina the following May, and between New Zealand and California the following September. The first contact between New Zealand and California happened in September 1924, and just a few weeks later came the first contact between New Zealand and the US East Coast (Connecticut). Organizers say "the ultimate" contact between Frank Bell, Z4AA, and Cecil Goyder, G2SZ, took place in October 1924. Activated by the Kiwi DX Group, ZM9ØDX will operate from locations around New Zealand on all bands and modes from 1.8 MHz to 1.2 GHz and beyond. A commemorative QSL card will be available, and there is an award program for contacts with New Zealand during the event period as well. Further details are on the ZM9ØDX website. Well-known DXer Martti Laine, OH2BH, reports that the first Amateur Radio licensing course in the Republic of Kosovo is nearing its end; passing the license exam will pave the way for 10 Technical University of Pristina students to become licensed Amateur Radio operators. The course was supported by the International Amateur Radio Union (IARU) Region 1, and it used both Croatian and UK course material. Radio equipment is in place for students and local amateurs at the Amateur Radio Association of Kosovo (SHRAK), currently located on the university. The Yasme Foundation helped the new association to get started. "We had a superb field day with the students up at the mountain with generators and more," Laine told ARRL. "We also set up few new stations with locals. Great bunch!" Amateur Radio in the former Serbian province fell victim to civil unrest and war during the breakup of the former Yugoslavia, and hams were forced to go dark for more than 20 years. It's been a year since any substantive operation from Kosovo, which is not a DXCC entity, although Laine, operating as Z68BH, was active this month during the Worked All Europe DX Contest, for which Kosovo counts as a multiplier, and he reported making more than 100 contacts. Vjollca Belegu, Z61VB (ex-YU8AW), is SHRAK's vice president. She headed the license preparation program. Reuters reported earlier this month that Serbia had dropped its opposition to assigning international telephone area code to its former province. The move marks the latest concession by the Balkan country as it seeks to start membership talks with the European Union in January. 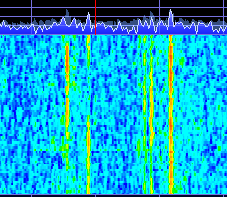 According to The Daily DX Editor Bernie McClenny W3UR, "[T]his usually follows or precedes issuance of an ITU call sign block. If so, this would finally qualify Kosovo for DXCC." Under current DXCC rules, Kosovo does not qualify as a DXCC entity. For that to happen, Kosovo must become a UN member or be assigned an official ITU prefix. Kosovo's telecommunications regulatory authority will issue Z6-prefix call signs to visiting radio amateurs for a fee. Kosovo also counts as a "country multiplier" for the CQ World Wide DX contests. Read more. Mike Carroll, N4MC, who operated the "Vanity HQ" website for 14 years before taking it dark earlier this year, says the National Silent Key Archiveâ¢ of Amateur Radio Operators that he founded remains up and running. "The only thing that was carried over from Vanity HQ would be the unique call lookup," Carroll told ARRL. On the "Tools" menu, click on "Research Hams" to enter a name or a call sign. The National Silent Key Archive provides an opportunity to add Silent Keys (all submissions are reviewed prior to incorporation into the Archive) and for friends and family of radio amateurs who have passed on to create memorial pages that may include photographs and text. Carroll points out that the National Silent Key Archive has been up and running for 2 years or so and functioned separately from Vanity HQ, which, he reiterated, he has no plans to resurrect. According to the site, "The purpose of the National Silent Key Archive is to collect and preserve photographs, life event narratives, and data artifacts of deceased Amateur Radio operators, and to make the Archive's digital library available to anyone wishing to view its contents online. Tad "Ain't No Sunspots" Cook, K7RA, Seattle, Washington, reports: Our sun is still very quiet, but solar flux and sunspot numbers were higher this week than the week previous. Average daily sunspot numbers rose from 42.3 to 75.6, and average daily solar flux rose from 95.3 to 109.6. There were no big geomagnetic events this week. ...and all the way down to 90 on October 16-19. In the Friday bulletin, look for an updated forecast, and at least one reader report of on-the-air activities.